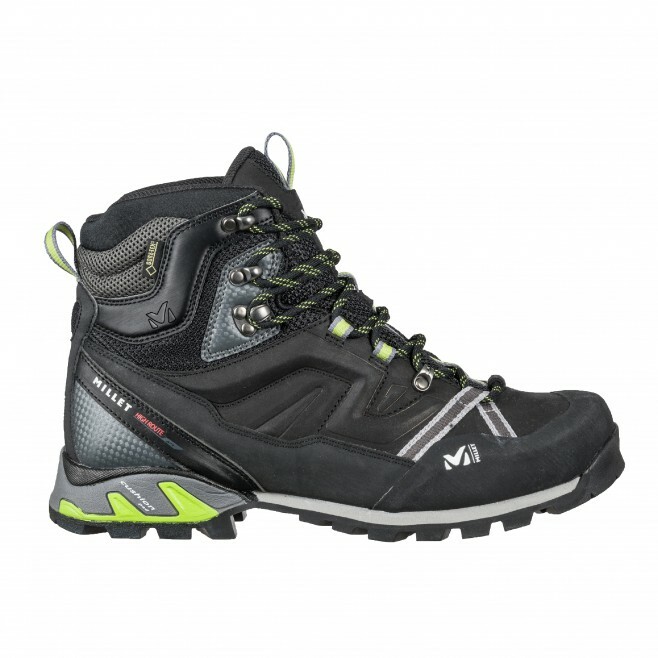 The HIGH ROUTE GTX boot is designed for mountain-sports enthusiasts and for high-tempo walks on steep terrain. With a nubuck leather upper and a semi-rigid soft flex, this high-cut model blends classi c style and terrific comfort. The nubuck's velvety surface is resistant to wear and teamed with a waterproof, breathable GORE-TEX membrane which stops the wet getting in on long rambles, assisted by NEOPRENE gaiters. A rubber toe cap and heel guard protect the foot from knocks and damage. The high-traction Vibram�� outsole delivers strong grip on diverse terrain. The Phylon and EVA foam midsole provides excellent cushioning and stabilizes the heel. The complete boot gives foot and ankle support, while enabling easy motion. This model is a perfect mix of ruggedness and lightness. MILLET's ALPINE TREK FIT provides comfort while erasing pressure points on ankle, heel, instep and toes. The built-in A.F.C structure respects the natural flexion of the foot and heel, supporting the heel and snugly wrapping the instep. Compatible with light crampons and snowshoes, this boot is also suited to long excursions on challenging terrain and snow-covered trails.